[142 Pages Report] The global ring main unit market is estimated to be USD 1.64 Billion in 2017, and is expected to grow at a CAGR of 8.35% from 2017 to 2022. 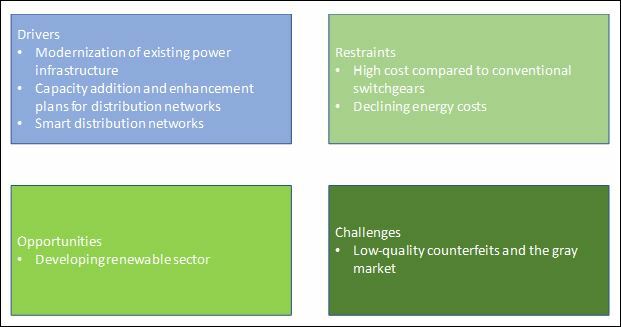 Increasing smart distribution networks and power generation capacity addition & enhancement plans for distribution networks are major factors driving the ring main unit market. Ring main units are switching devices employed in the ring circuits of secondary distribution networks. These devices ensure the maximized protection of circuits and other equipment connected to them. The main advantage of ring main units is that they can be connected to multiple power sources for uninterrupted power supply. These devices are available with various insulating media, subject to demand from consumers. The global ring main unit market size is projected to reach USD 2,454.4 Million by 2022, largely due to increasing modernization of power infrastructure, growing activities in capacity addition and enhancement plans for distribution networks. Ongoing smart distribution network investments and developments by many countries are likely to propel the growth of the ring main unit in the long-term forecast. Many utilities and distribution centres around the world prefer switchgears over ring main units due to their low cost. Ring main units are kind of switchgears with added protection for consumers and loads connected to it. Conventional switchgear offers the same switching properties as ring main units but lack in safety and power security. Additionally, they increase the overall use of distribution cables and lines in ring or mesh networks. Ring main units have the added benefits of supply from two sources and lowered expenditure on cables and lines. The cost barrier restraints the growth of ring main units market with users inclined towards employing conventional switching solutions. This research study involved the use of extensive secondary sources, directories, and databases such as Hoovers, Bloomberg Businessweek, Factiva, and OneSource to identify and collect information useful for a technical, market-oriented, and commercial study of the global ring main unit market. Primary sources are mainly industry experts from core and related industries, preferred suppliers, manufacturers, distributors, service providers, technology developers, standard & certification organizations of companies, and organizations related to all the segments of this industry’s value chain. The points given below explain the research methodology. Study of contracts and developments related to the ring main unit market by key players across different regions such as ABB, Ltd. (Switzerland), Schneider Electric SE (France), Eaton Corporation, PLC (Ireland) etc. 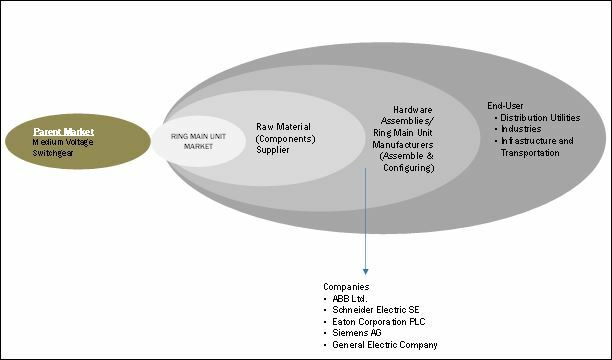 The ecosystem of the global ring main unit market starts with raw material suppliers, which include electronic/electrical components and precision metal works such as metals, sensors, insulators, and micro-processors, among others. In the later stage, manufacturing of ring main units takes place where all raw materials are assembled. These devices are then distributed to distribution utilities, industries, T&D companies, and renewable companies. Which key players have strong advantage on price? Who are the key contenders in the unorganized market? Which are the new opportunity areas and what are the best sales channels to gain a quick entry? Which industry segments have simpler buying process, and which vertical are switching their existing switching solutions to RMUs? 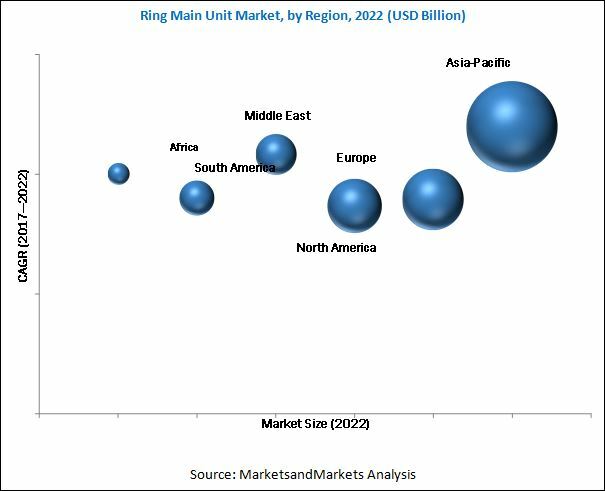 The global ring main unit market is projected to grow at a CAGR of 8.35% from 2017 to 2022, to reach a market size of USD 2.45 Billion by 2022. This growth is attributed to modernization of existing power infrastructure and huge electricity demand in developing countries. Investments for renewable power generation in Asia-Pacific countries have been planned to meet the rising power demand. These investments in turn are going to boost the demand for ring main units. The report segments the ring main unit market on the basis of installation, into outdoor and indoor. The outdoor segment is projected to dominate the ring main unit market and is expected to grow at the fastest rate during the forecast period. The ring main unit market is segmented based on type, into gas insulated, air insulated, oil insulated, and solid dielectric insulated. The gas insulated segment accounted for the largest market size in 2016. This segment is expected to grow at the fastest growth rate from 2017 to 2022, owing to increasing application of gas insulated ring main units in power grids, underground installations, wind power plants, and mining applications. Moreover, gas insulated ring main units are compact in size and have better functionality compared to other types of ring main units. The gas insulated ring main unit market is expected to witness the maximum growth in the Asia-Pacific region. The report segments the ring main unit market on the basis of application into distribution utilities, industries, and infrastructure & transportation. The distribution utilities sub-segment accounted for the largest market share in 2016. This segment is also expected to witness the highest CAGR during the forecast period, due to increasing investments in the power sector in Asia-Pacific to augment generation capacities to meet the growing power demand in the region. Meanwhile, developing economies in Asia-Pacific and Africa comprise fast growth markets for the distribution utilities segment. In this report, the ring main unit market has been analyzed with respect to six regions, namely, Asia-Pacific, Europe, North America, the Middle East, South America, and Africa. Asia-Pacific is projected to dominate the global ring main unit market by 2022 and is expected to grow at the highest CAGR from 2017 to 2022. There has been growing power demand in Asia-Pacific, as a result of which, substantial investments have been made in the region to augment power generation capacities. These investments are expected to boost the demand for ring main units. Countries such as India, Vietnam, Malaysia, and Japan are driving the ring main unit market in Asia-Pacific. Asia-Pacific has some of the key companies including Larsen & Toubro (India) and LSIS (South Korea). The cost of ring main units is more as compared to conventional switchgears. Hence, several utilities and other distribution centers prefer conventional switchgears over ring main units due to their low cost. Conventional switchgear increases the usage of distribution cables and lines in a ring network, while ring main units have added benefits, such as reduced number of cables and supply from two sources. Therefore, high cost of ring main units as compared to conventional switchgear is a factor that is restraining the growth of the market. Additionally, the energy cost is declining with the addition of low-cost energy production in renewables. As a result, the profit margins of distribution utilities have reduced, thereby, forcing service providers to cut investments in modernized power equipment, such as ring main unit. 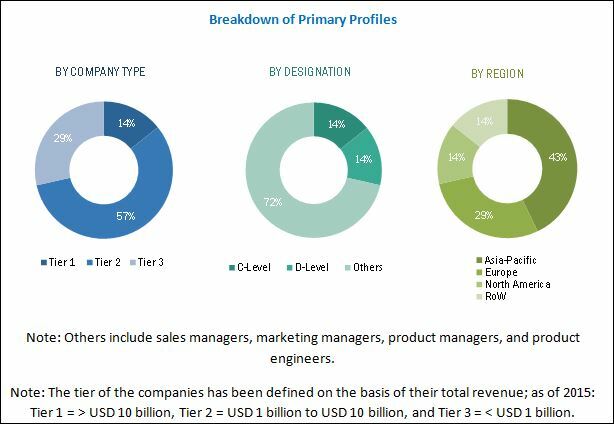 Leading players in the ring main unit market include ABB (Switzerland), Schneider Electric SE (France), Eaton Corporation, PLC (Ireland), Siemens AG (Germany), and General Electric Company (U.S.). Contracts & agreements was the strategy most commonly adopted by top players in the market from 2013 to 2017. It was followed by expansions, new product developments, and mergers & acquisitions. Gas insulated RMUs are expected to have a larger market share due to their functional advantages such as compact size, and climatic resistance and ease of adaptability. Applications of gas insulated ring main unit include railway systems, wind power plants, power grids, underground installations, and mining sectors. Asia-Pacific is the largest market for gas insulated ring main units. Increasing power consumption in the region and need for reliable power supply drives the demand for equipment like RMUs. Asia-Pacific and Africa have strong market opportunities for air insulated RMUs in the forecast period. Asia-Pacific houses major growing economies such as China, India, Malaysia, and Indonesia. These countries have planned to improve their electricity distribution sectors, thereby boosting the demand for equipment such as air insulated ring main units. 11.8 LS Industrial Systems Co., Ltd.
11.13 Enetec Electric & Electronic Co., Ltd.